In an attempt to boost recruitment and to shore up retention, the Canadian Armed Forces have recently made several changes to regulations regarding the dress and deportment of uniformed personnel. First, it was allowing male service members to grow beards. Previously it was only sailors on shore duties and in the pioneer section in infantry regiments that were allowed to grow facial hair. 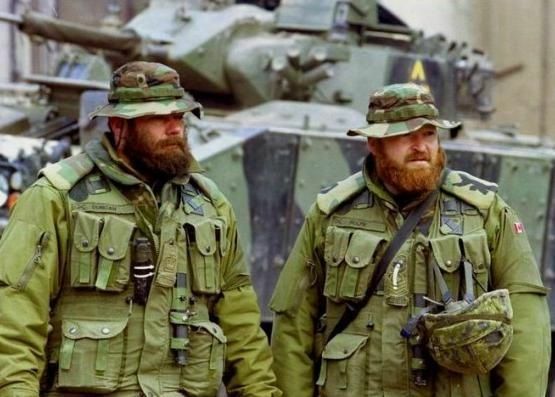 However, during the lengthy deployment in Afghanistan Canadian Special Forces operatives began sporting beards, and the ‘cool factor’ generated by these elite commandos led to the practice being authorized in theatre for all frontline soldiers as a cultural recognition for local Afghan custom. This trend continued among Canadian Special Forces operatives when they deployed to northern Iraq in 2014, and continues to this day despite the fact that the vast majority of Iraqi males are clean-shaven. But I digress. An allowance has also been made in the case of female footwear, wherein personnel are now authorized to wear flats, rather than the previously specified 5 cm heels. The one exception to this remains the prohibited wearing of ballerina style shoes. Again the stated intention of making these dress code amendments is to improve the morale of the currently serving women, and to make the military a more attractive career option for the younger generation of female recruits. I dare say that it is a slippery slope once you start making allowances to accommodate individual tastes in an institution that’s core value is disciplined conformity. The U.S. is facing a similar crunch in terms of maintaining their military manpower levels, due to widespread disinterest in the current generation to embark upon a martial career. In an effort to get recruits in the door, the U.S. has begun to offer signing bonuses of up to US$40,000, as well as incentives to pay off student loan debts. Last year the Pentagon spent a whopping US$600 million on signing bonuses, along with US$1.6 billion on recruiting. For the first time in history, even the U.S. Marine Corps has had to start enticing recruits with cash incentives. More alarmingly, since 2017 the Marine Corps has had to reduce its minimum admission standards and offer 25% more medical, mental health, recreational drug and misconduct waivers just to meet their minimum manning levels. Canada led the way down this path when they set the basic fitness recruitment to zero back in 2006. That’s right folks, even if you cannot perform a single sit-up, you can still enlist in the CAF. The premise for this is that, should you desire a career in uniform, they will invest the time and energy required to get you into shape prior to beginning basic training. We also upped the maximum age for recruits to 57 years. As long as you can still fulfill a three-year basic engagement before the mandatory retirement age of 60, you can join the CAF. I still believe that the Canadian military is not just among the best in the world – it is the best in the world. However, I fear that if we change our recruiting ideology from the ‘be all that you can be’ to ‘be what you want to be’ we will soon lose that edge.